Fall officially began last Friday, and October begins today. So along with trading my floppy moccasins for leather boots, I’m trading my summer ice cream fetish for hot chocolate. During the warm months I have a thing for ice cream—it’s hard for me to walk by a yellow Van Leeuwen truck or any gelataria without sampling the goods. And then as soon as the weather turns cool all of a sudden I have no problem passing up a cone of mint chocolate chip or a cup of black sesame, say. But I just trade one habit for another. Now I have to avoid the stretch of 18th Street between 5th and 6th Avenues to avoid City Bakery lest I indulge in a daily splurge of their famous liquid chocolate (yes it’s made from melted chocolate bars). Luckily I no longer work near either of Jacques Torres‘s locations in Dumbo or West SoHo so that settles that. Well a hot chocolate habit can get pretty expensive—at nearly $5 a pop at Pain Quotidien (a stone’s throw from my office) and $3 at Pret (also within stone-throwing distance) it was time I got creative and got in the kitchen. I don’t generally buy milk anymore. I just didn’t have that many uses for it. Lately I rotate among three alternatives: rice, soy, and almond. I like them all for different reasons. Rice is great with cereal or on its own; soy is best as a substitution in recipes and sauces in place of milk; and almond is when you want something lighter. So last week, on the first day of fall in fact, I found myself at home wanting hot chocolate but unwilling to venture out into the pouring rain to get some. I had almond milk in the fridge so started by warming up a cup in a small saucepan on the stove. Now all I needed was the chocolate and the sweetener, both of which could take multiple forms. I have Fox’s U-Bet syrup in the fridge for making classic egg creams but that seemed too cloying for the occasion. I had a bar of dark chocolate but was saving that to eat on its own. So instead I opted for the cocoa powder in my cupboard. As for adding sweetness, I passed up the agave, white sugar, brown sugar, cane sugar, and honey in favor of…you guessed it folks…Vermont Grade B maple syrup. 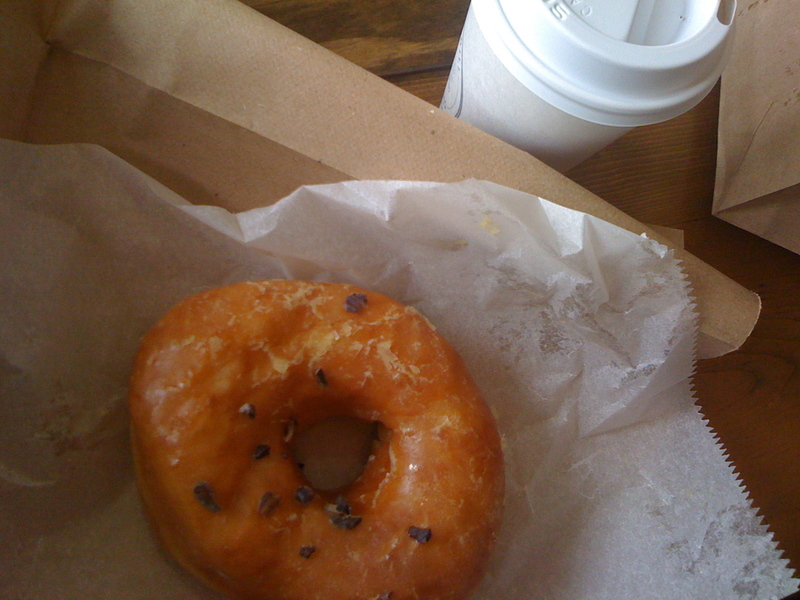 You might recall my post back in the spring for Vermont iced coffee sweetened with the stuff. I added less than a tablespoon but more than teaspoon of the cocoa powder to the almond milk heating in the saucepan, and a small spoonful of maple syrup. I heated it up for about 5 minutes until hot but not boiling then served in a big ‘ol mug. So there you have it folks: vegan hot chocolate. That was not my intention per se but it was delicious, chocolatey, and not too sweet at all, just the way I like it. It went down as smooth as ice cream. Put the milk in a small saucepan and turn the heat on low. Add the cocoa powder and maple syrup, stir, and heat up for a few minutes until hot but not boiling. Serve on its own, with whipped cream, or a tiny pinch of cayenne to spice it up. Now the photo up top is not in fact from a hot chocolate quest, but is from this morning’s field trip with a few new friends in my neighborhood. 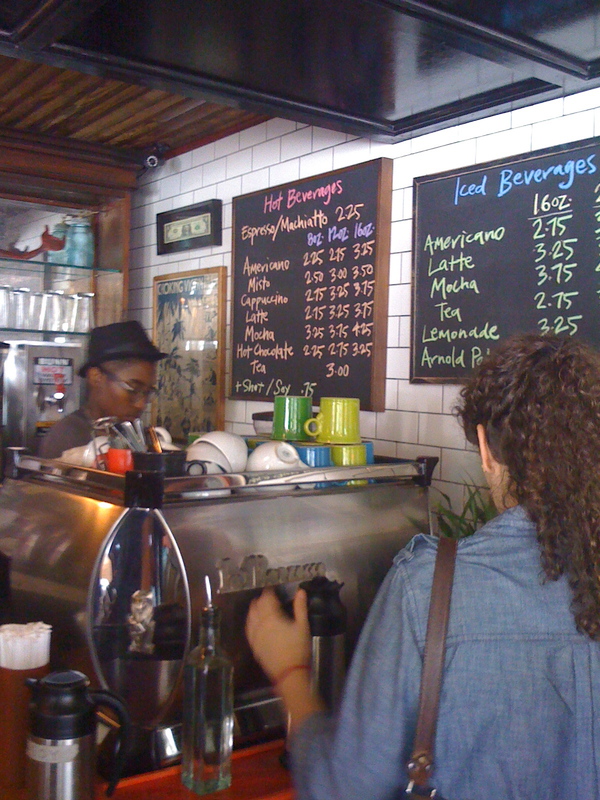 This is Bedford Hill Coffee Bar, on Franklin Ave. in Bed-Stuy, home of delicious americanos and pastries. And below, well that would have to be Dough now wouldn’t it? Just up the street from Bedford Hill, Dough makes delectable yeast donuts with wacky flavors like passionfruit with cacao nibs, dulce de leche with toasted almonds, and a bright pink hibiscus donut. Today I opted for passionfruit.